An apple a day keeps the doctor away…and there are two in this recipe so it must be very healthy! Preheat the oven at 160°C. Grate the apples and mix in to the flour and baking powder. Add the rest of the ingredients and stir well. Pour into the baking form and bake for one hour (well a t least that’s what it said in the recipe, I had it in for one and a quarter hours). Leave to cool down. Get yourself comfy and indulge! Bet that a slice of apple choc cake is lovely with a cuppa tea! Do you need to use spelt flour or can you use plain flour or self raising instead? You can use plain or self raising flour, I just had spelt at home. Yes, I am down to have an apple a day if I get to eat this cake! 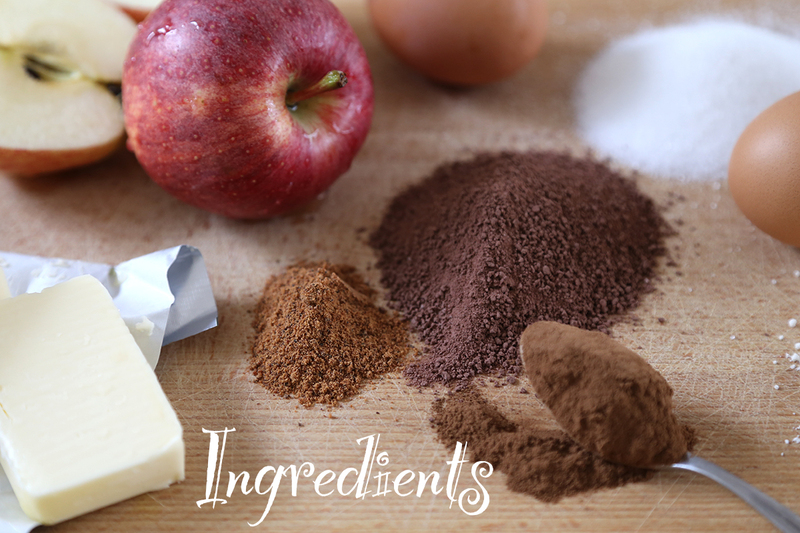 I love apples and chocolate and cakes but for some inexplainable reason I never once thought about baking an apple-chocolate ANYTHING! What’s wrong with meeeeee? That’s an interesting combination. And I. Do love your photography techniques! Yum! Doesn’t the chocolate overpower the apples? I bet it’s a really moist cake, right? Looks yummy thanks for sharing! Thanks for the recent like on my Blondie post. I followed you and hope you won’t mind following back? I have many recipes on the way! Hmmm this recipe looks really good! I’ll try it out and share it on my blog, tagging you! I’ll send to your email, then! This looks so yummy and moist! I want to give this a try for sure! My first thought was, “Horrah! I don’t have to read (or scroll past) 600 words of back story before I get to the recipe!! When I am looking for recipes, I wish I could just get right to the good stuff. What’s in it, what does it look like, how do I make it? My second thought was how I like the picture collages. The pictures are gorgeous, and I can see the story in pictures, but it speeds things up the way you’ve presented them. I must be getting bogged down with blogs! Just today, I have seen two blogs presenting pictures in this way, and I am going to start doing it, myself. Oh – the recipe looks delicious, too (and, isn’t all chocolate good for us??). I’ve liked you on fb, and look forward to updates. I am not a very stylish person, but I am always open to learning! this looks so moist! Love a good choccy cake recipe. Yummy and healthy are our favorite combinations! And with chocolate! What a bonus. Thanks for the recipe! Oh this looks really good, I’m going to try it! Would this work with wheat flour, do you think? Or is that heresy? I have just got some spelt flour and need more recipes so am going to try this one. Did you use cooking apples or sweeter eating apples? I used eating apples because I had them rolling around the fridge but I’m sure you could use cooking apples too. looked again at the photo and think it must be eating apples. Also is that 80 grams of chocolate powder – can you use cocoa? ?